SpoonThat.com - Flavorful Food Recipes by The Spoonful! 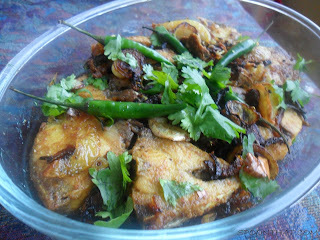 : Elish Maacher Bhuna---Hilsha cooked the Bengali way! Elish Maacher Bhuna---Hilsha cooked the Bengali way! This crispy, crunchy fish dish tweaked with a few spices and fresh ingredients is a dish often prepared and really liked by people from Bangladesh. Its one of the easiest Bangladeshi recipes for Elish or Hilsha and goes perfectly with a helping of steamed white rice and a serving of daal. It takes me back to the day when I was a kid and really not in the mood to eat, but was lured into trying some by my ever-so-patient mom. Since then, it has reminded me of home in Bangladesh and my family through the eyes of the child that I was; back when life was so simple! If you are from Bangladesh, you know exactly what I`m talking about and know how good Elish Maach is made the simple way. And if you have never tried it before, I urge you to try it if you know how to eat bone-in fish steaks (otherwise, I would recommend using a different fish). Soak the fish in salt water for 10 minutes before washing really well. Marinate fish in all marinade ingredients and let sit for 10 minutes. 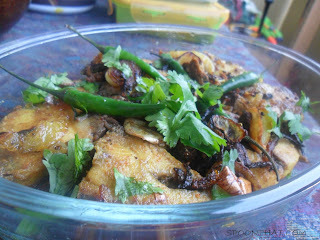 In a large skillet fry fish pieces on medium high until cooked through and crispy. Remove. In the same pan, add the extra oil if needed and drop in the cumin seeds. once they start to sputter, add in the onions.You just need enough oil to prevent the onions sticking to the pan. After your onions become translucent, add the sliced garlic and green chillies if you wish. Once the raw, garlic aroma has gone, add in all the dry spices and stir in immediately followed by the water. Once the water comes to a boil, add in the fish pieces and cover and cook on high for 2 minutes before flipping the fish and cooking for additional 2 minutes. Turn off stove and dish out the fish and sauce garnishing as desired.